The original post (changed to grey color) following the line below is updated. Now the IPCC's Fifth Assessment Reports (a.k.a. AR5) are all released except the Synthesis part. There is a relatively new IPCC-like intergovernmental organization focusing on biodiversity and ecosystem services. The Intergovernmental Science-Policy Platform on Biodiversity and Ecosystem Services, or IPBES, has launched in 2012. I welcome this new organization wholeheartedly. See, the title of my blog is "Energy and Ecology." If the IPCC is more about energy (as a means of climate change mitigation), the IPBES is more about ecology. Just as the IPCC has done to connect science and policy since the publication of the First Assessment Report (FAR) in 1990, the IPBES is planning to generate timely assessment reports regularly for the world's policymakers. The first global assessment of the IPBES is scheduled to be published by 2018 and will replace the Millennium Ecosystem Assessment (published by WRI, UNEP, the World Bank, and UNDP in 2005) as the most authoritative report on the status of the Earth's biomes and ecosystems. The following figures are a beautified version of the IPBES's analytical conceptual framework and operational conceptual model drawn by the Platform's experts at the 2013 IPBES's second Plenary (IPBES-2). These figures will provide a basis of future IPBES studies. In the analytical framework (Figure 1), there are six building-blocks and two big arrows representing spatial and temporal scales each. 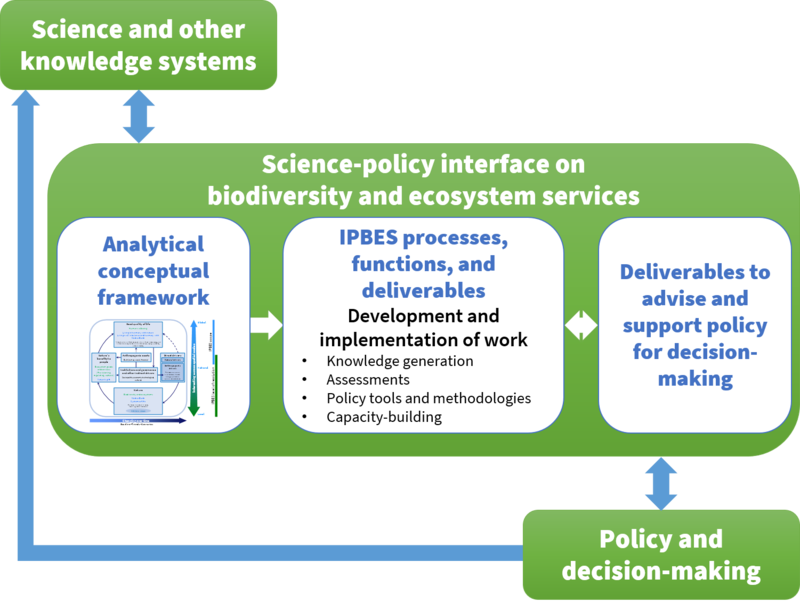 The operational model (Figure 2) explains how science and policy interacts with each other through the IPBES processes, while the analytical framework supports the four functions of the IPBES – knowledge generation, assessments, policy support tools and methodologies, and capacity-building. 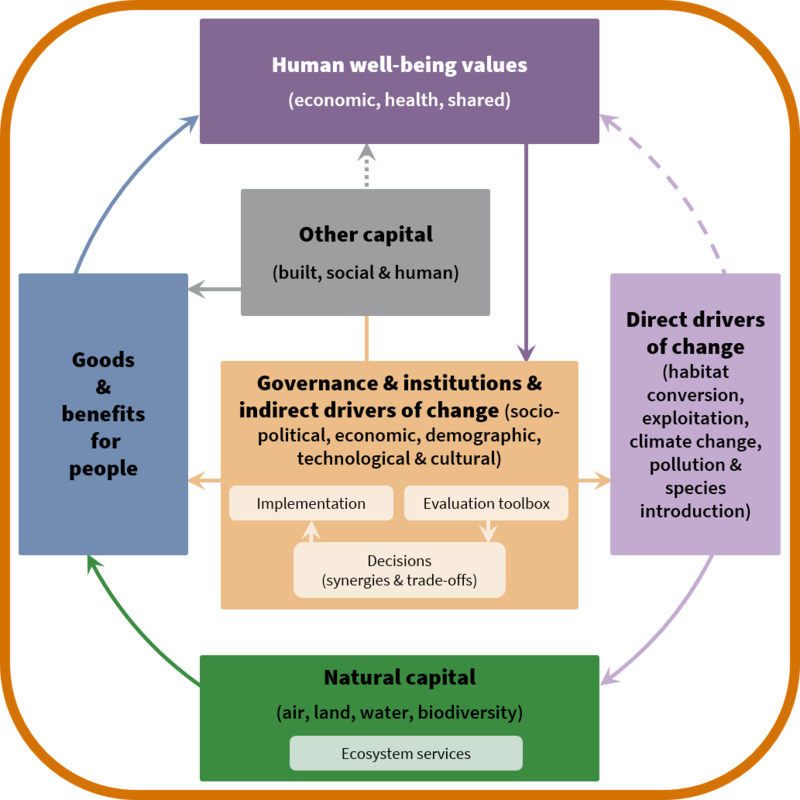 These figures appear to be influenced by the conceptual framework of the United Kingdom's 2011 National Ecosystem Assessment (2011) as well as that of the United Nations Millennium Ecosystem Assessment (2005). 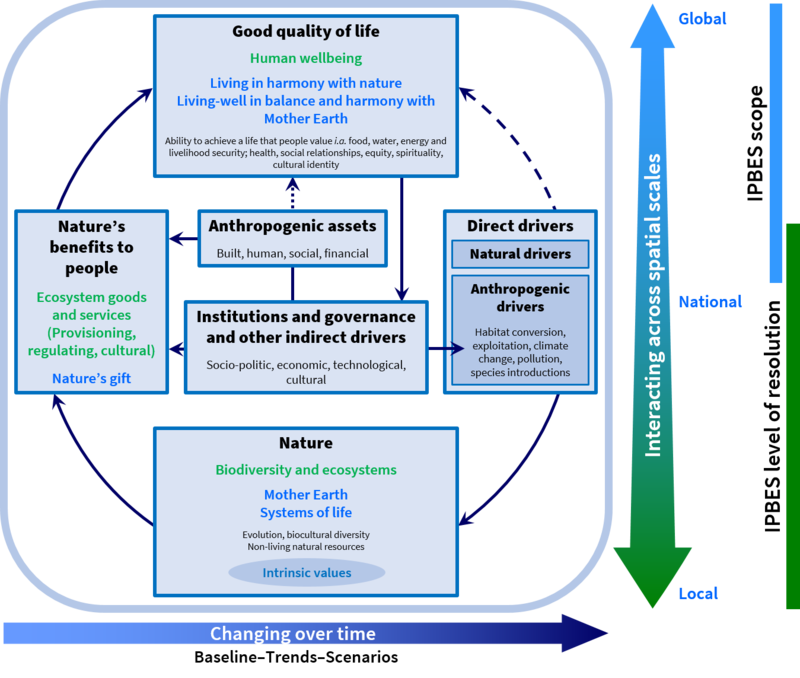 Interestingly, the IPBES analytical conceptual framework has made the UK NEA framework updated as manifested in its follow-on phase report (2014) (Figure 3). A detailed explanation of Figures 1 and 2 can be found in the IPBES-2 report (2014) and could be compared with the conceptual framework of the Millennium Ecosystem Assessment. Source: My drawing based on IPBES-2. Source: My drawing based on UK NEA FO.